This entry was posted in The Traveller's Tree and tagged Artemis Cooper, Patrick Leigh Fermor, The Traveller's Tree, William Dalrymple on April 17, 2015 by proverbs6to10. We continue our series of articles looking at the work of Ian Fleming who was a friend of Paddy. 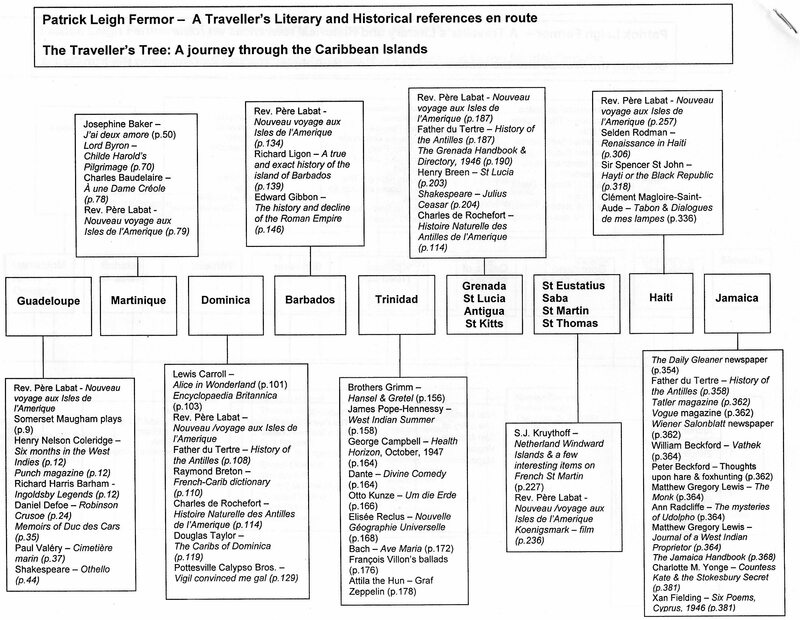 Fleming was influenced by Paddy’s exploits and he used the Traveller’s Tree in particular as a source for Live and Let Die. There is one last James Bond book from the late 1950s that remains unpublished. We will not find the typescript lurking in the archives, nor hidden amongst the papers held by Ian Fleming’s estate, for this book is not about James Bond but written by Bond himself. 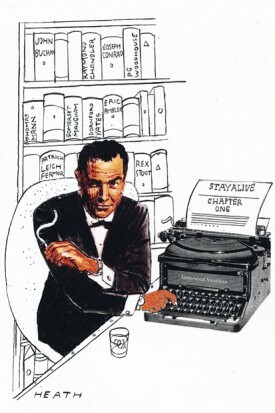 It is from Fleming’s 1959 novel Goldfinger that we learn that 007 spends his hours on night duty at the Secret Service compiling a manual on unarmed combat called Stay Alive!, containing the best that had been written on the subject by his peers in intelligence agencies around the world. Bond is more industrious in the field than at the typewriter and no more is heard about this great unfinished work once his thoughts drift back to his previous assignment and time spent enjoying the company of the ill-fated Jill Masterson. It should come as no surprise that Fleming’s hero has writerly pretensions. Yet again, Bond and his creator have interests or characteristics in common, along with their shared dash of Scottish ancestry and background in naval intelligence, and a similar penchant for custom-made Morlands cigarettes. During his twenties, Fleming read widely in French and German literature — Thomas Mann’s The Magic Mountain was a particular favourite — and he subscribed to all the avant garde literary magazines of the day. He experimented briefly with poetry, collected first editions for a while, and launched the Book Collector magazine. Ultimately, through his friend and later editor, the poet and novelist William Plomer, he entered the literary world of postwar London, met T.S. Eliot and befriended Edith Sitwell. But to what extent did these kind of literary and bibliographic interests shape or influence Fleming’s work when he began writing the Bond books? Bond too is, of course, a man of books. Fleming took the name of his hero from the spine of a trusted ornithological guide to the West Indies. And the seemingly effortless, spontaneous genesis of the first Bond novel, Casino Royale, published in 1953, drew as much upon the author’s reading of Dornford Yates, John Buchan and ‘Sapper’ (creator of Bulldog Drummond) as it did on his wartime experiences. The clubland stalwarts were formative influences on Fleming, but they are — at best — literature spelt with a very small ‘l’. Bond himself has bookish impulses: the book-lined sitting-room glimpsed briefly in Moonraker is a valuable resource, used in preparations for forthcoming missions, furnishing him in this instance with a volume on card-sharping by John Scarne. Researching details of voodoo rites in Live and Let Die, Bond consults The Traveller’s Tree by Fleming’s friend Patrick Leigh Fermor. Appropriately enough, 007 also likes a good thriller and purchases the latest Raymond Chandler at the close of Goldfinger, and in On Her Majesty’s Secret Service displays a ready familiarity with the Nero Wolfe series, written by the equally well-read Rex Stout. It turns out that M too knows of Wolfe. En route to Istanbul in From Russia with Love, Bond enjoys a literary busman’s holiday by reading Eric Ambler’s The Mask of Dimitrios. One might pause to consider just how do spies respond to fictional rehearsals of their trade? Did 007 snort in derision at Ambler’s accidental hero — himself a crime writer — or nod in recognition at his frustrations and disillusionment? Would he compare the quality of Ambler’s villains with those that he himself routinely faced in the field? Fleming’s villains themselves also appreciate a good book. At the start of From Russia with Love we discover that SMERSH’s chief executioner, Red Grant, likes to unwind by reading P.G. Wodehouse, and no one in the organisation would dare question such a choice. Literary references and analogies frequently run through Bond’s mind: an allusion to Paradise Lost appears in the short story ‘Risico’, where he is disguised, naturally, as a writer; a line from Ralph Waldo Emerson strikes him in Diamonds are Forever, when he realises that he is sharing a ship with two of the Spangled Mob’s henchmen; he even attempts composing a haiku in You Only Live Twice. None of the above, read in context, would have found a receptive audience with the likes of Eliot and Sitwell, or indeed among the literary pals of Fleming’s wife Ann. Fleming’s at times uneasy proximity to such circles never influenced the Bond books’ plot or structure, nor determined his initial choice of genre, but it did shape the author’s conception of the ‘literary’ and his recognition of how appreciation of ‘fine’ writing and the ‘right’ kind of books might be used for rhetorical effect, to engender the desired impression of his central character. The literary references in the Bond books are comparable to the furnishing of technical details about cars, dining, drinks, gambling and the like that the author employs to ground his fantastic plots in a recognisable reality — what Kingsley Amis identified as ‘the Fleming effect’. They help to build up Bond’s characterisation in deft, if brief, brushstrokes. It could be suggested that the spy thriller itself — certainly after Somerset Maugham’s 1928 Ashenden — became the perfect genre with which to explore so many of the anxieties about identity and its representation to which the modernist greats gave expression. Like Eliot’s Prufrock, Bond and his peers are for-ever preparing ‘a face to meet the faces’ that they meet, always working with that lurking uncertainty as to whether they are the hero or the anti-hero of their own life’s narrative. Joseph Conrad had earlier delved into similar territory in his thriller The Secret Agent. Had Fleming lived to tell of 007’s eventual retirement from the Secret Service we would undoubtedly have witnessed Bond swap his Walther for a pen and become a writer, thus following the career path of previous agents turned authors, W. Somerset Maugham, Graham Greene, John le Carré, Stella Rimington and, of course, Fleming himself. He might even have completed Stay Alive! This entry was posted in Paddy's Friends, The Traveller's Tree and tagged Ian Fleming, The Traveller's Tree on March 8, 2014 by proverbs6to10. Ryan Eyre lives in Seattle, and took a journey to Kardamyli to meet Paddy in 2009. He has written this article for the Journal of the Book Club of Washington, and has asked to publish it here as well. Ryan tells us, as many others have done, about Paddy’s remarkable memory, which he utilised to the full to write A Time of Gifts and Between the Woods and the Water. I have seen evidence of this myself. On a recent visit to Cluj I was able to enter the public rooms of the fabled Hotel New York (Continental) clutching a copy of BTWW and marvelled at the accuracy of Paddy’s description of its decor … but the cocktail bar was closed! Update: I met Ryan last month (5 June 2013) in London and was able to show him the site of the original John Murray publishing house at 50 Albemarle Street. Ryan was on a holiday from his post in the Republic of Georgia where he is teaching English. He reminded me of this article which was posted in the week following Paddy’s death. It may have got lost in all the high frequency posting at that time, so I promised him that I would give you all another chance to read his account. Born in 1915 and educated at the King’s School in Canterbury until he was expelled at the age of sixteen, he was preparing for the entrance examinations for Sandhurst when a sudden inspiration came over him. He decided to walk across Europe, with the final destination point as Constantinople, living, in his words, “like a tramp or a wandering scholar.” It was December 1933 and he was eighteen years old. He set out almost at once, catching a tramp steamer from London to Rotterdam and beginning his walk from there, passing through the Netherlands, Germany, Austria, Czechoslovakia, Hungary, Romania, Bulgaria and European Turkey before arriving in Constantinople on New Year’s Day, 1935. His experiences on his thirteen-month peregrination later provided the material for his two most celebrated books: A Time of Gifts and Between the Woods and the Water, which were first published in 1977 and 1986, respectively. These two volumes recount the first two-thirds of his amazing journey by foot from the Hook of Holland to the Golden Horn. Richly descriptive and full of historical and literary allusions they provide a portrait of a pre war Europe long since vanished. Apart from the extremely high standard of prose and the author’s obvious enthusiasm for history, literature and art, perhaps the most appealing aspect of his account of this remarkable journey is that it was completed on foot. It has been said that the human mind can only properly absorb its surroundings at a walking pace. The gradual transitions of landscape, language and culture were carefully observed by PLF because of the patient, unhurried approach that he took; a faster form of travel would have failed to capture nearly as much of the richness and complexity of the lands he passed through. After completing this walking journey, he spent the next couple of years in Greece and Romania. He was romantically involved with the Romanian princess Balasha Cantacuzene, living with her on her estate in Moldavia until the outbreak of the Second World War in 1939, at which point he returned to Britain to enlist in the army. During the war he served with distinction in Greece, both during the German invasion of 1941 and afterwards during the occupation. As a SOE (Special Operations Executive) agent he helped coordinate the resistance movement on Crete. The highpoint of his war was the celebrated kidnapping of the commanding German general Heinrich Kreipe on Crete in 1944, which he and a fellow British officer devised and accomplished with a band of Cretan partisans, abducting the luckless general from his car outside of Iraklion and spiriting him away into the mountains and eventually Egypt. 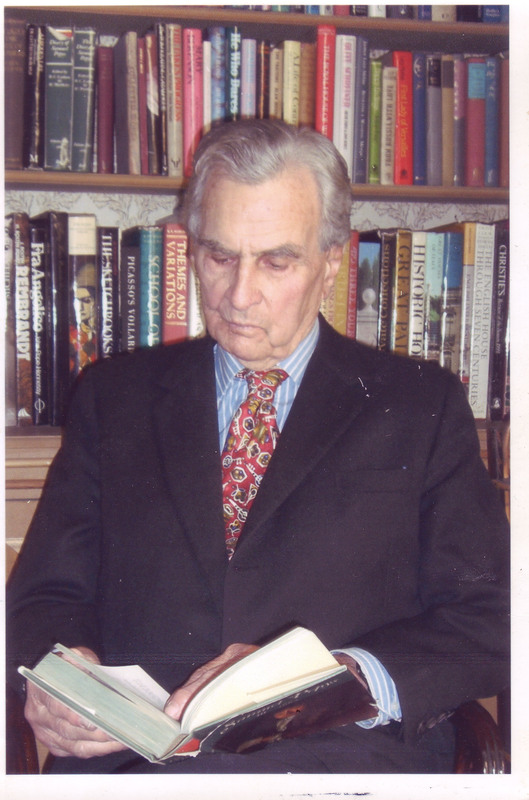 After the war and in the company of his wife, the late Joan Eyres-Monsell, he travelled all over Greece, exploring the most remote rural areas on foot or mule, and developing a deep appreciation of the folk customs, dialects and traditions that have in the last half century largely vanished (see his books Mani and Roumeli). His travels and books have never been limited to Greece, though: his first book The Traveller’s Tree (first published in 1950) was written after an extensive journey around the West Indies in the late 1940’s. Possibly his best book (according to New Yorker columnist Anthony Lane), A Time to Keep Silence, explores the nature and meaning of silence as he experienced it living in various French monasteries. Whatever topic PLF has written about, his natural enthusiasm, curiosity and exquisite writing make it compelling reading. Several years before I had been travelling in Romania and by chance a fellow American in the hostel had shown me a copy of Between the Woods and the Water, in which PLF recounted travelling through the same area in the 1934. Intrigued when I returned to Seattle several months later, I had checked A Time of Gifts out from the library and was instantly enthralled by it. The subject matter, the style and the sensibilites were immediately appealing. I can state unequivocally that PLF’s writing had a powerful influence on me. He seems almost the embodiment of an ideal-the literary man of action. Highly erudite but also a man of the world, unapologetically articulate and learned but with enough graciousness and charm to avoid being a pedant, equally comfortable with the humble as well as the high born. I’m not the only one who views him this way – Bruce Chatwin, Colin Thubron and William Dalrymple have all cited PLF as a major influence on their writing and lives. From PLF I developed a deeper appreciation of art and literature, and renewed an interest in history-particularly European. Because of him I also became a better traveller– by slowing down, more closely observing my surroundings and immersing myself in the history of a place before I visited. I became determined I had to meet this man. I knew he was old and in declining health so time was of the essence. In January of 2009 I was in England visiting relatives and went to his literary agent’s offices in London hoping to get a formal letter of introduction. I only spoke to a secretary, who passed on an email address to which I wrote but predictably from which I heard no reply. My cousin said “The only way to meet the blighter is to show up where he lives-I’m sure you’ll be able to meet him.” I decided to take his advice and hope for the best. Thus a month later I arrived in Kardamyli with a mixture of excitement and trepidation, after having travelled over land and water from Portugal all the way to Greece. I had done my homework: I knew his former housekeeper (a woman named Lela) ran a taverna with some rooms in the town-that seemed the obvious place to stay. Before my arrival I had telephoned and had spoken to her son Giorgios (Lela spoke no English). In the winter the taverna was closed, Giorgios explained, but they would make an exception for me and at a reduced rate. Giorgios, a moustachioed and world- weary but courteous man in his fifties met me when I got off the bus, and after introductions were made, he walked me to Lela’s a few blocks away. It was a simple two story building by the sea, with a restaurant on the ground floor and a few rooms upstairs looking directly out on the sea. Lela appeared from the kitchen, in her seventies but still sprightly, with a craggy and quintessentially Greek face. After showing me to my room she and Giorgios disappeared quickly, leaving me as the only guest. Strolling out from Lela’s along the water onto a jetty and looking up towards one of the clearest starlit skies I had ever seen, with the only sound coming from the waves crashing against the rocks, I understood immediately why Patrick Leigh Fermor had decided to settle here years before. The next morning I awoke early and walked along the road going south from Kardamyli. A Greek man out in his garden saw me and gestured for me to come inside. Without asking any questions he sat me down in his kitchen and served me coffee; this was exactly the type of hospitality towards strangers that PLF had described in his books on Greece. 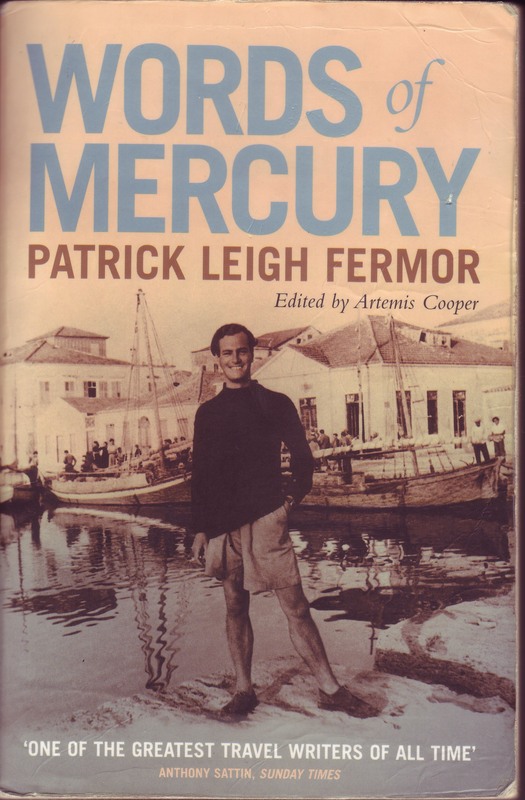 Somewhat timorously I broached the subject of Patrick Leigh Fermor (known as Michalis by the locals) and asked where he might be found. He gesticulated southwards, saying in broken English that PLF lived a short way down the road, in the next cove known as Kalamitsi. I thanked him for the coffee and continued walking. I had with me an anthology of PLF’s work titled The Words of Mercury, which included an article he had written on how he had designed his house in Greece. He described it as resembling a faded Byzantine monastery, with a view framed by cypress trees overlooking a cove with a small island offshore. Down a path and through an olive grove there was a house that closely resembled this description; in fact, it had to be his residence as it looked far older than any other house in the vicinity. Emboldened by this discovery I walked back into town, just as the villagers were exiting the church service on a Sunday morning. Approaching Lela, I tentatively mentioned PLF’s name and pointed to The Words of Mercury, with a photograph of PLF in the 1940’s on the cover. She gave Giorgios soon appeared and I explained that I had come to Kardamyli to hopefully meet PLF, and handed him a note of appreciation that I entreated to pass along. Giorgios told me that PLF was in England at the moment, but would be back by Tuesday and would gladly give him the note once he saw him. So my timing had been providential! Now I simply had to wait. I spent the next couple of days either reading (finishing War and Peace to be exact) or going on long walks exploring the myriad of small coves and hills. The Mani is very quiet in winter and felt refreshingly unexplored. Each evening I would go to the kafeneon to sit with the local men as they chatted and watched football on the television. Giorgios would be there every evening and he was quite friendly and talkative to me. Every evening I would tactfully bring up the subject of whether or not he had seen PLF. Each time he responded he hadn’t yet. One evening as I was returning to Lela’s she insisted on cooking me a meal in the kitchen, sitting me down in a table in the restaurant and plying me generous portions of pork, potatoes and vegetables. On a table in the corner was a pile of black and white photographs; examining them more closely I saw they were informal snapshots of Lela and her family from the 1960’s with a younger looking Patrick Leigh Fermor in a number of the them. Seeing these candid photographs gave my purpose a lot more immediacy. Taking the bus one day into Kalamata (the nearest city-some 20 miles away) I fell into conversation with a local woman about my age. I explained that I had come all the way here to hopefully meet PLF. She raised her head backwards and clicked her tongue, the universal Hellenic gesture for disapproval. “The Patrick Leigh Fermor is very old man, many people, journalists come here to meet him, they have to book appointment…it’s not so easy to see him.” Discouraging words and with each passing day I realized that Giorgios was probably protecting PLF’s privacy…it was perfectly understandable but I made up my mind to take a more direct approach. I wrote another, longer letter of appreciation (I wrote about eight drafts before I was satisfied) and screwed enough courage up to go to what I was almost sure was PLF’s house to give it to whomever answered the door. Just as I was about to knock an Englishman in his forties opened the door and walked out to the driveway. He introduced himself as Hamish Robinson and confirmed that PLF did indeed live there. Hamish added PLF wasn’t very well at the moment but he would gladly pass on the note of appreciation and went back inside. I decided to walk south several miles to the next village called Stoupa. I had done everything realistically possible to meet PLF and if I wasn’t able to at this point I accepted that it just wasn’t to be. Walking along the coastal road with its stupendous views of the Messenian Gulf to the west and the snow-capped Taygetus Mountains to the east, I felt fortunate and privileged to be there at all. Returning to Kardamyli later that afternoon in a state of calm resignation, my interlocutrix from the bus the previous day came running down the road. “Ryan, where you been? We been looking for you all day. Patrick Leigh Fermor wanted to have a drink with you but we couldn’t find you.” Patrick Leigh Fermor wanted to have a drink with me? Suddenly a car pulled up. It was Hamish. “We were looking for you earlier today –come round for lunch at 1:00 tomorrow,” and then drove off. I couldn’t believe my luck…all the persistence had paid off…I was actually going to have an audience with Patrick Leigh Fermor after all — it was more than I could have asked. The appointed hour couldn’t come fast enough and it was in state of mild disbelief that I found myself being admitted into PLF’s house by his housekeeper and into the sitting room (which doubled as a dining room), with prodigious book shelves on three sides. I found myself standing in front of a distinguished, slightly frail looking man wearing a blazer and a tie. It was Patrick Leigh Fermor. Shaking my hand, he briefly mistook me for somebody else before apologizing with, “I’ve got this blasted tunnel vision and I can’t see that well…so you’re the young man…so glad to meet you.” His hearing and his eyesight were poor and I had to speak loudly to be heard. Hamish Robinson was there as well (his presence helped facilitate conversation) and for the next two and a half hours the words flowed, abetted no doubt by the several vodka and tonics that were consumed as well as the generous glasses of retsina that accompanied lunch. Conversation ranged from Lord Byron (PLF: “I didn’t care for him much when I was younger but now I adore him”), the Greek Orthodox Easter service, and the fate of King Harald Hardrada at the Battle of Stamford Bridge in 1066-to name a few of the topics discussed. When I told him I had visited Romania several years before he asked me, “Did you go by foot?” Unfortunately, of course I had to answer no. He also asked me questions about Seattle (“Where does the name come from?”). He had only visited the United States once -when he was invited by a Cretan-American association in New York as an honoured guest to commemorate the anniversary of The Battle of Crete. Surprisingly he seemed a little fussier and more self-deprecating than I would have thought. When I quoted from his writings a couple of times he responded, “That’s a bit fruity” or, “What absolute drivel.” I mentioned that I had tried to contact his literary agent in London but without success. His reply: “Oh do you know, I’ve never met him either.” Time passed quickly and after the meal was finished we walked onto the terrace of his house, overlooking the sea. I thanked him for the invitation. He replied, “If you’re ever in these parts again, do come round.” And then he retired for his customary afternoon nap, “Egyptian PT,” in his words. Hamish showed me the adjacent building where Paddy does his writing, giving me a recent photograph of him taken on his 94th birthday as a memento, and then with good-byes and sincere thanks, I gracefully made my exit. I felt a mixture of elation –having the extraordinary privilege of actually being a guest of the celebrated author in his home — and a bit of melancholy in seeing him in his twilight years. It was surely the only occasion I would meet him, and there was so much more I wanted to ask that would never be said. I also suppose, perhaps there was the realization that for all this accomplishments and marvelous writing he was still human after all. The next day I left Kardamyli. Spending even a week in the Mani gives Patrick Leigh Fermor’s life and work so much more immediacy. When I read a passage in Mani describing the view looking out towards the Messenian Gulf with “dragon headed capes in the distance,” I know exactly what this looks like because I have seen this view myself. That means almost as much as having met the man, and both memories will last for the rest of my life. This entry was posted in Interviews with Paddy and tagged A Time of Gifts, Between the Woods and the Water, Ill Met by Moonlight, Kardamyli, Major General Heinrich Kreipe, Mani, Patrick Leigh Fermor, Roumeli, The Traveller's Tree, Words of Mercury on July 11, 2013 by proverbs6to10. The first of a series which presents work done by members of the Royal Geographical Society which analyses chapter by chapter literary and historical references from some of Paddy’s key work. This was presented at the RGS in the afternoon talk on 12 December “Patrick Leigh Fermor: An Appreciation by Alexander Maitland, FRGS”. My thanks to the Royal Geographic Society for permission to present this. This entry was posted in The Traveller's Tree and tagged Alexander Maitland, Caribbean, Patrick Leigh Fermor, Royal Geographical Society, The Traveller's Tree on May 5, 2012 by proverbs6to10. The next stop After The Traveller’s Tree was …. …. an Indian hut in El Castillo (Nicaragua?) 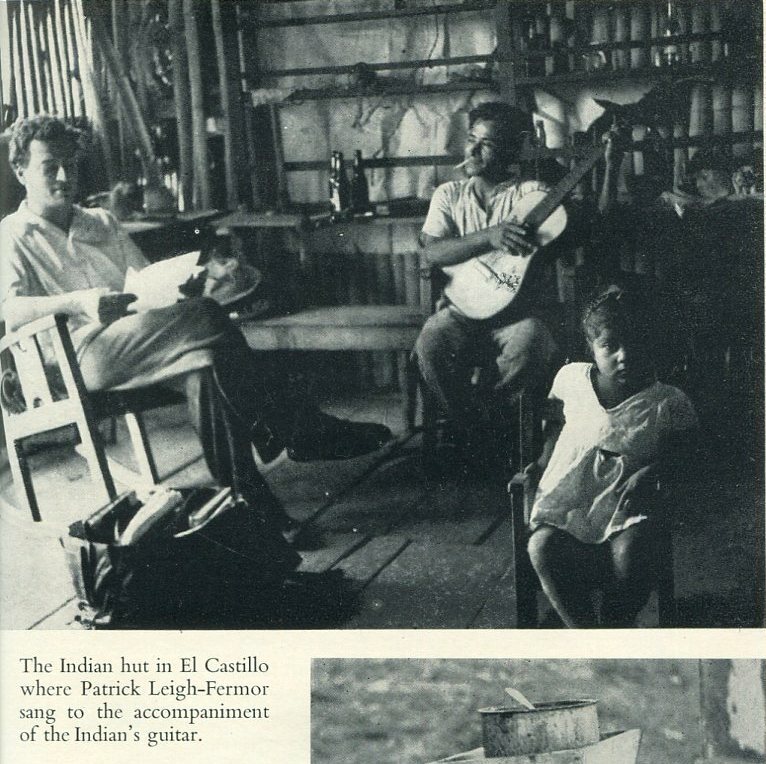 where Paddy sang to the accompaniment of an Indian playing his guitar. What on earth did he sing? 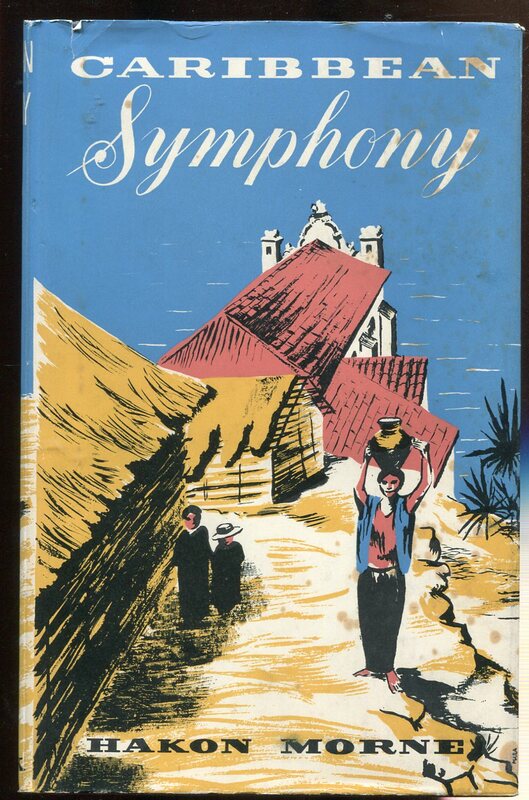 I am grateful to Phyllis Willis for being a better mole than me and finding Hakon Morne’s book translated into English as “Caribbean Symphony”. She has purchased a copy but was clever enough to get a couple of scans whilst she waits for her book to arrive. I am delighted to be able to share these with you now. This entry was posted in The Traveller's Tree and tagged Hakon Morne, Joan Leigh Fermor, Patrick Leigh Fermor, The Traveller's Tree on October 3, 2011 by proverbs6to10. After The Traveller’s Tree … what was the next stop? I have received a very interesting email from Bo Nensén in Sweden. He recounts a story from the work of the prolific Swedish travel writer Håkan Mörne, about Joan and Paddy travelling onwards to mainland South America after their travels in the Antilles. I think this is something that we know little about. It raises the question of how do we find out more about this episode in their travels? Take a look at Bo’s message and let’s see if we can find out more together. Like many others I was also delighted to find your PLF blog. I must have missed it when I made a search for PLF last year but in any case I then noted the existence of “In tearing haste” and ordered it even if I haven’t read it until two months ago when I first learned about his death. I had no idea about his visit to the mainland until I happened to read a book by a Finland-Swedish travel writer by the name Håkan Mörne (1900-1961). In one of his books he describes how he on a ship on Lago de Nicaragua meets Joan and Patrick (and Costa) and how they travel together to the Atlantic coast. This part comprises 30-40 pages and there is even a picture of PLF when singing(!) Mexican songs. Are you aware of this book? I don’t know if anything by Håkan Mörne is translated into English. The version I’ve got is called, in translation, “Volcanoes and Bananas” but there is a previous, somewhat longer edition titled “TheGilded Poverty” (which I’m now about to order from an antiquarian bookshop. This entry was posted in The Traveller's Tree and tagged Joan Leigh Fermor, Patrick Leigh Fermor, The Traveller's Tree on October 1, 2011 by proverbs6to10. Before long, the droopy-lidded devotees of Jah are not only answering his question in detail but also “hospitably” rolling him a joint “unwieldy as an ice-cream cone.” Here already in Leigh Fermor’s first book, originally published in 1950, is the winning mix of nerve, curiosity, and cheer, so charming to readers and other cultists, that marks his two-part masterpiece, A Time of Gifts (1977) and Between the Woods and the Water (1986), an account of a rather longer walk, from Holland to Turkey. But unlike those volumes, The Traveller’s Tree, which skips along the Antillean island chain from Trinidad to Cuba, was written within only a year or two of the trip it records. Leigh Fermor’s European trek, on the other hand, had four decades to mellow and ramify in memory before he wrote about it. For all its remarkable vivacity, that later work doesn’t preserve the sort of small irritations that give some passages here a cranky (and often very funny) edge, complementing his usual lyricism. He notes that “hotel cooking in [Trinidad] is so appalling that a stretcher may profitably be ordered at the same time as dinner,” complains of the “thuggish vegetation” that blankets the southerly islands, and, on realizing that he has been the victim of a friendly prank, emits a “H’m” of pique. Some people travel to blot home, or the past, from their minds. Not Leigh Fermor, who always keeps one compass leg fixed in his intellectual home—literary Europe. The book closes with words from his seatmate on the return trip, an emigrant Greek, and opens by describing his trip as an Odyssey. Sixty years and seven books later, that almost seems like an understatement. After all, Odysseus left home only once. This entry was posted in The Traveller's Tree and tagged Caribbean, Patrick Leigh Fermor, The Traveller's Tree on August 26, 2011 by proverbs6to10.